either AV pursues a new engine it can acquire quickly, like TR-107, or CST-100 will be looking for a new ride. CST isn't a national security satellite. True but do you believe there will be a contract extension and Atlas V continuing to fly unaltered for civil payloads when military payloads have switched? Nope - that is a good point. That only applies to *future* contracts. LM reportedly has 15 engines in hand and something like 30 on order under the existing contracts. Anyone near get us some close-ups? Found some more pics and story ..
Sen. Nelson was there, giving a speech and crawling inside the mockup, which the reporter described as "America’s next spaceship destined to carry humans". Were any U.S. Senators at the SpaceX unveiling? Is it just me, or the distribution of the interior is very unusual? "The vehicle includes five recliner seats, [...]"
Second reference to 5 seats in Commercial Crew CST-100. IIRC this mockup's been seen so it wasn't really an unveiling. Several key congressmen from committees that matter, along with Sen. Nelson & Sen. Heinrich, were at the DC event. Technocrat spotted at the event Reps. Chaka Fattah, D-Pa., Mike Honda, D-Calif., and Dana Rohrabacher, R-Calif., and Sens. Bill Nelson, D-Fla., and Martin Heinrich, D-N.M. Nearly all sit on committees that set policy or draft spending bills for NASA. The House Intelligence panel’s ranking Democrat, Maryland’s C.A. “Dutch” Ruppersberger, was also spotted. KENNEDY SPACE CENTER, Fla. — Hoping for the best, but preparing for defeat, Boeing will send out about 215 potential layoff notices to employees currently working on its NASA CST-100 Commercial Crew program. 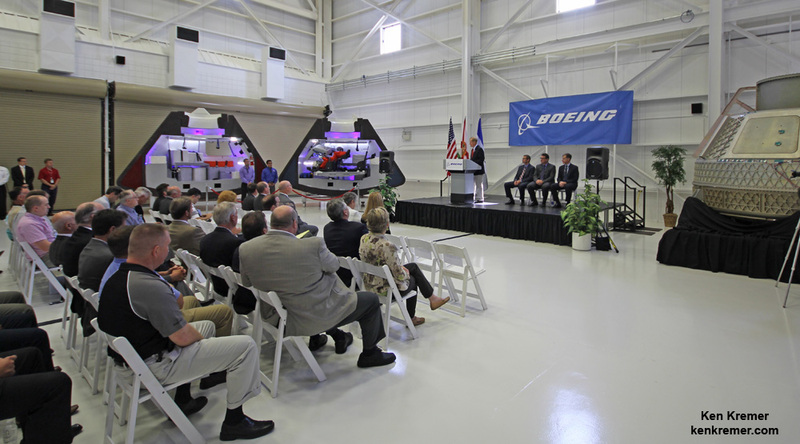 The 60-day notices, required under the federal Worker Adjustment and Retraining Notification Act (WARN), are due to be distributed on June 20 to about 170 employees in Houston and 45 in Florida in case Boeing is not selected for an upcoming Commercial Crew Transportation Capability (CCtCap) contract, Boeing spokesman Adam Morgan told SpaceNews. “It’s just a standard way … to minimize potential business impact,” added John Mulholland, Boeing Commercial Crew program manager. I don't think too much can be read into the WARN notices except that the people working on the CST-100 don't have immediate alternative internal job opportunities if they aren't awarded a CCtCap contract. It also shows Boeing has little faith in Bigelow and is unwilling to continue development on the CST-100 on it's own dime. Both SpaceX and SNC have stated they will keep development going. After reading that article, were is Boeing's commercial market they were to have? So no tax payer money, then no CST-100 from Boeing? Mulholland said “several hundred” employees currently work on the CST-100 program, including just under 100 in Florida. So not everyone involved is getting a notice. I'm not sure if that signifies plans for any ongoing investment in CST-100 if they lose the contract. It could be that everyone not getting a notice has a potential assignment on another project.